You'll be hooked on the flavor and texture. 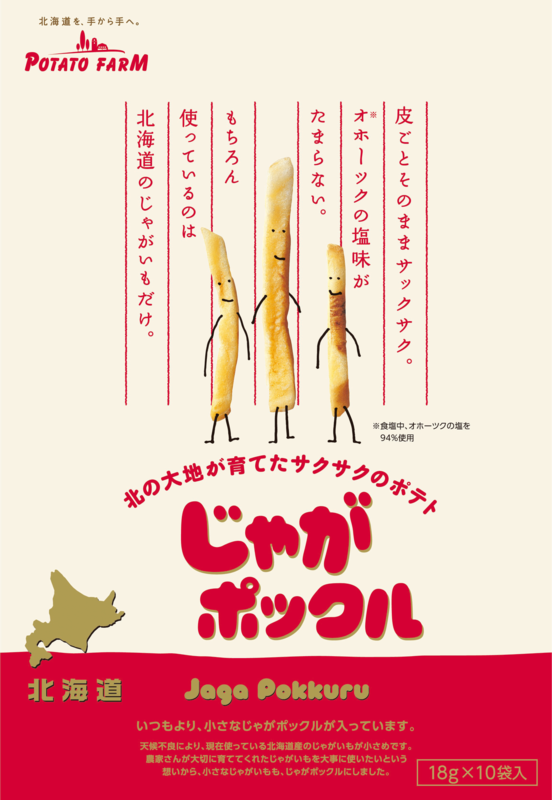 Jaga Pokkuru is a popular Hokkaido snack. 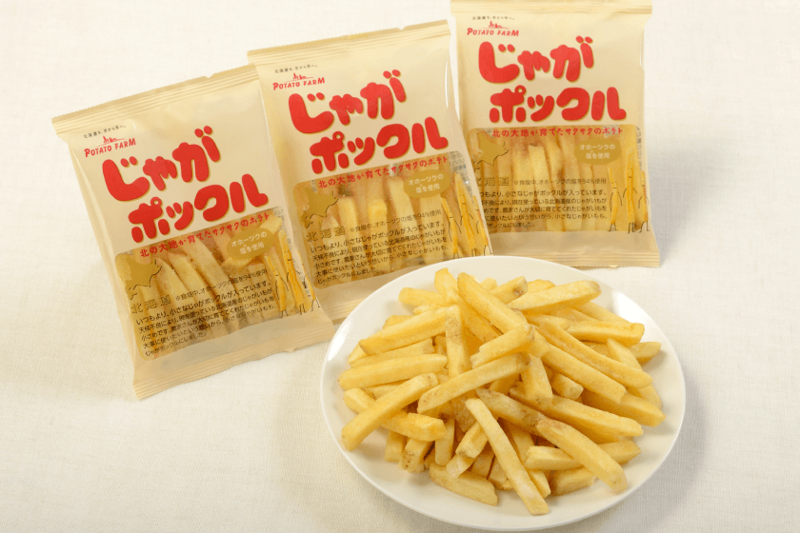 This adorable Hokkaido product is made from potatoes of three different colors and varieties. land and sea in Hokkaido. You'll love the crisp freeze-dried edamame soybean and potatoes that are slow-fried at low temperature. Enjoy the texture and aroma. A new product from Hokkaido. Salted caramel coating pairs perfectly with the flavor of potatoes. This creamy potato soup is made from the Danshaku variety of Hokkaido potato. A rich, sweet corn potage with whole kernels of corn. Sweet corn powder is made from 100% Hokkaido corn. The rich flavor of onions and potatoes. A new potage debuts! Add four types of flavor powder to crunchy potatoes and shake! Crunchy potatoes and crispy kelp. This is a perfect marriage of land and sea in Hokkaido. Mmmm, toasty aroma!Real smoked potatoes. Jaga Pokkuru has been a long-seller, for its unique texture. If you're looking for potatoes with great taste and quality, look no further than Hokkaido-grown potatoes. 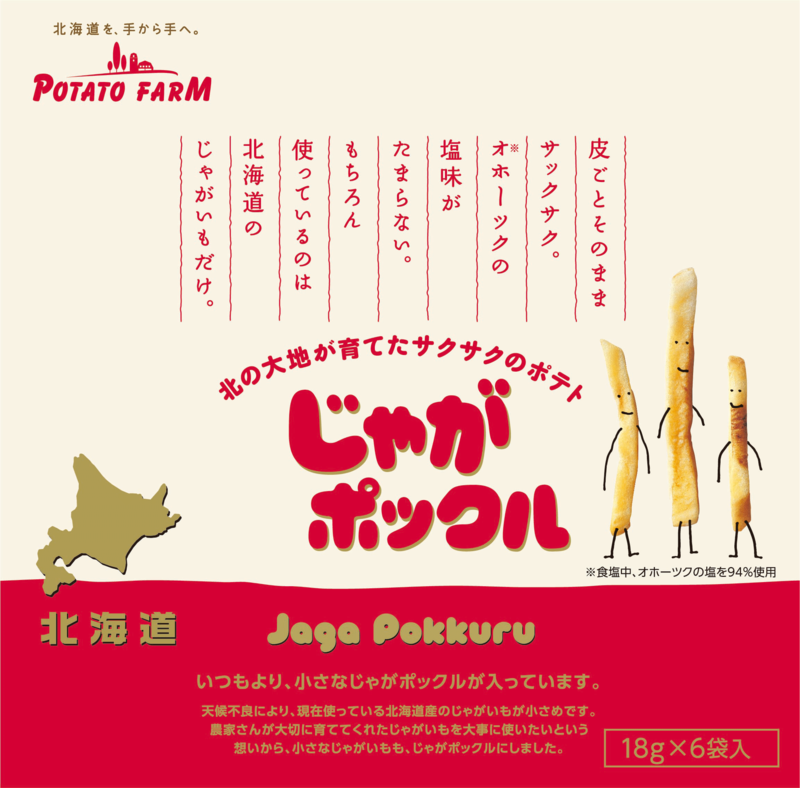 "Jaga Pokkuru" is made from 100% Hokkaido-grown potatoes. Flavorful Hokkaido potatoes are grown in a crisp climate with big differences in temperature between day and night. In collaboration with potato farmers, we've developed the perfect soil and fertilizer for potatoes. After the potatoes are harvested, they're checked for quality and stored at strictly controlled temperatures, before the next step. The secret behind the superb flavor is the original crispy texture and roasted salt from the Okhotsk district. 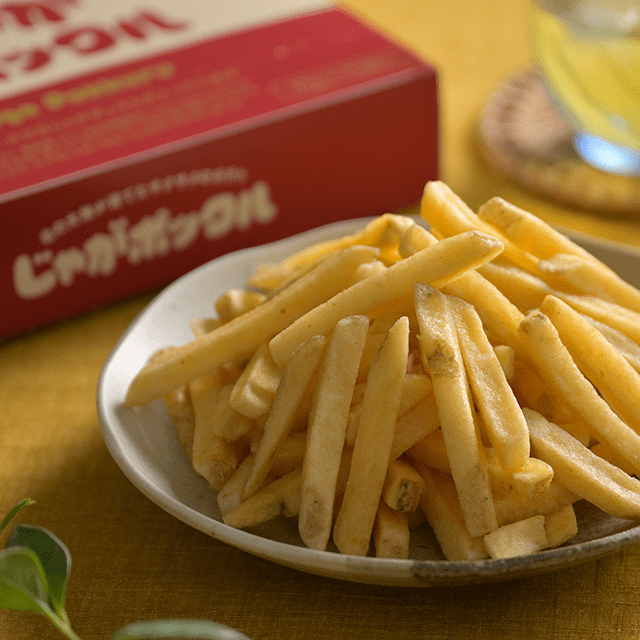 We carefully select large Hokkaido potatoes to suit our products. 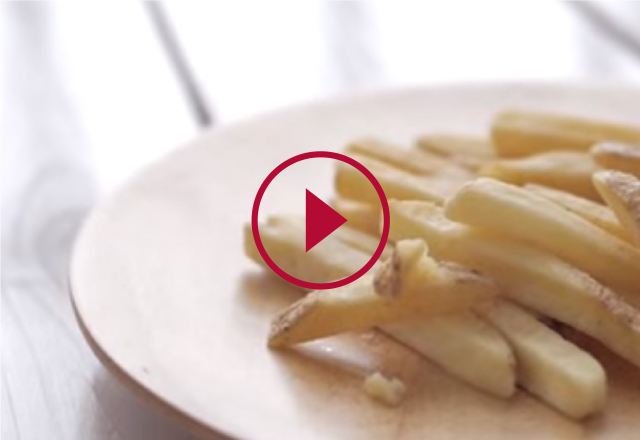 We use choice potatoes that are cut without peeling to retain the flavor of the skin. 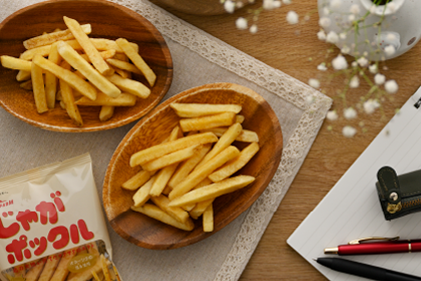 Our unique processing method achieves a crispy texture and brings out the potato’s innate flavor. The roasted salt from Okhotsk adds even more Hokkaido flavor. This salt is distilled from the waters of the Saroma lagoon. Simmering in the kettle causes the salt to mellow in flavor. Jaga Pokkuru was named after Koropokkuru, a dwarf from Ainu folklore. "Koropokkuru" is Ainu for "he who lives below the leaves of the butterbur plant". Legend holds that Koropokkuru is too shy to be seen but is kind enough to share food by putting it near the homes of Ainu in the middle of the night. Koropokkuru is said to be a god of happiness. Potatoes (non-GMO), vegetable oil, dextrin, salt, konbu extract powder, starch, yeast extract powder / seasoning (amino acids and other), antioxidant(V.C). *In accordance with the Food Labeling Act, Calbee labels a total of 27 ingredients: mandatory items (7 items), and items that are recommended to be indicated(20), if used as an ingredient in their product. This is a translation of indicated items according to the Food Labeling Act of Japan. Information given in Japanese is the official version. Calbee is not liable for the accuracy of translation into each language. Copyright © Calbee, Inc. All Rights Reserved.